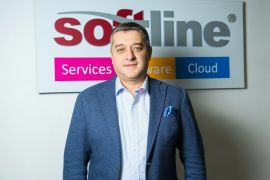 - Softline is a global provider of IT solutions and services on a world scale. Over the years, we have become the owner of a large number of certifications awarded by the giants of the IT market such as Cisco, Microsoft, Google, Oracle, Amazon, etc. Among our clients are more than 60,000 private and public organizations: from large corporate customers to medium and small businesses. More than 1100 account managers, 400 solution sales professionals, 500 engineers and technicians help customers choose the best IT solutions and implement them competently. The company's main strategy is to be innovative and closer to customers. I note that the appearance of "cloud" systems completely changes the IT ecosystem, so the company invests in the development of new products and services. At this year’s exhibition, we showcase solutions for the Smart City, along with the solutions for optimizing the business in our market. We pay great attention to security solutions, both informational and physical, which we demonstrate at our stand. Softline has been a regular participant and information partner of Bakutel exhibition for ten years. The autumn edition of the Softline-direct catalogue is traditionally timed to the date of this event, participation in which positively affects the image of the company. Bakutel 2017 is a unique platform where experts and users can meet and choose the most profitable tools for data processing. Here we are striving to demonstrate the success of the company over the past year and surprise customers with an effective way of solving any problems. The exhibition successfully shapes the trends of development of the IT environment in Azerbaijan for the upcoming year. We express our gratitude to Caspian Event Organisers for this unique opportunity to hold direct dialogues between partners and customers.